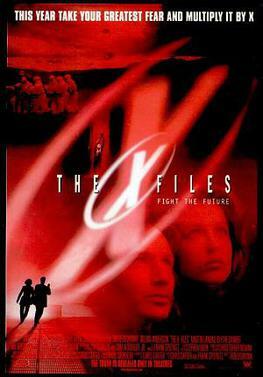 The X-Files: Fight the Future (1998) is this week’s pick for a (semi-) classic conspiracy/political paranoia movie. A big-screen entry that was wedged in between seasons of the original run of The X-Files television series, it’s loaded with conspiracies and intrigue, just the way fans of creator Chris Carter’s series like things. Also like the TV series, the film stars David Duchovny and Gillian Anderson, as well as Mitch Pileggi and William B. Davis. Also appearing are John Neville (also from the television series) and Martin Landau (who was not in the series), who offer wonderful performances, as always. Duchovny plays Fox Mulder , the FBI agent who is obsessed with alien abduction theories and the secret cabal he thinks is behind a conspiracy that threatens all of humankind. Viewers can sympathize with Mulder’s obsession, given that his sister was apparently abducted by aliens with the help of a secret group of human collaborators. Anderson plays Dr. Dana Scully, an FBI agent and also a medical doctor, who was originally supposed to help debunk Mulder’s seemingly crazy theories but eventually comes to see things mostly his way. The story has just about every conspiracy meme imaginable. The X-Files (in both its television and cinematic versions) is possibly the ultimate pop culture incarnation of the conspiracy motif as it existed in U.S. culture just before the beginning of the new millennium. The writers always did their research and the movie, as well as the series, often make direct reference to — or else imply knowledge of — an impressively wide range of conspiracy theories that really were floating around the culture at the time, even if this was usually at the fringes of society. Of course, what a viewer might notice is that when so many conspiracy theories are piled on top of one another — and that is the hallmark of The X-Files — it’s best not to think too much about them. Because as more and more conspiracy ideas are added to the ongoing mix, things get so much out of control that the whole situation starts to look a little silly. Somehow, however, The X-Files manages to wink at itself just as things start to get out of hand. This is helped immensely by Duchovny and Anderson, who have mastered a deadpan delivery when the script call on them to do so. Their throwaway observations and side-remarks are hilarious at times. They never break through the fourth wall, but they come awfully close — just close enough to reset a scene and draw the casual viewer’s attention away from just how ridiculous some of the things going on have started to become. Does this hidden-in-plain-sight absurdity devalue the movie (and series)? Not at all. The X-Files is very entertaining. And just like real life, it mixes the plausible with the ridiculous all together into a bizarre and perplexing brew. That means viewers have to decide for themselves what to take seriously, what to dismiss out of hand, and what to interpret as metaphorical rather than literal. To be sure, The X-Files: Fight the Future is “B movie” material, but it’s fun and interesting and surely deserves consideration in any list of conspiracy films. TO MARK THE 10TH ANNIVERSARY OF THE BOOK CONSPIRACY THEORY IN FILM, TELEVISION, AND POLITICS, I ‘M SUGGESTING A DIFFERENT CLASSIC FILM WITH A CONSPIRACY OR POLITICAL PARANOIA THEME EVERY WEEK THIS SUMMER. THINK OF IT AS A DO-IT-YOURSELF PARANOID SUMMER FILM FESTIVAL.